Weekend Wrap: Naim DSD support, Arcam MusicLife update, YouTube streaming plans | What Hi-Fi? From the news that Naim has added DSD support to its nDAC and DAC-V1, to YouTube eyeing up movie streaming and Arcam updating its MusicLife app with support for future components - it's What Hi-Fi? 's Weekend Wrap. Naim has released a software update for the nDAC and DAC-V1 that will bring DSD (Direct Stream Digital) support, following strong demand from users. The update will add single- and double-rate DSD to both models, and beta testers were adamant that sound-quality improved. The nDAC will accept DSD via S/PDIF or USB stick, while the DAC-V1 can accept DSD from a PC or Mac thanks to its asychronous USB input, as well as via S/PDIF. 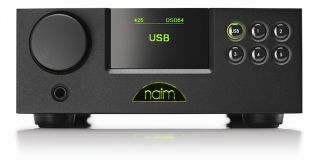 PC users will be able to download the new 2.00.0 driver from the Naim website. The firmware update for the Naim DAC can be found here, while the update for the DAC-V1 can be found here. Arcam has updated its MusicLife app, adding control for all of the company’s modern components, including the Solo Music/Movie systems and AVR550/850 Atmos receivers. The app can be used to stream audio via UPnP (Universal Plug and Play) to a networked receiver or speaker, or it can also be used to stream audio from servers to any Bluetooth device, including Arcam’s miniBlink and rBlink Bluetooth DAC. The MusicLife app is available free to download for iOS devices. Arcam has said that until it can significantly add to the Android experience, it won’t be producing a version of the app for Android devices. Panasonic has announced that owners of its 2015 internet-connected PVRs and Blu-ray recorders will now be able to access Freeview Play. The supported models include: DMR-BWT850; DMR-PWT655; DMR-PWT550; DMR-HWT250 and DMR-HWT150. Owners of these products should receive an on-screen prompt to download a firmware upgrade. Freeview Play will be available directly from the TV guide, or the Freeview Play home page. The connected TV service, which allows users to scroll back seven days to access catch-up content, has already been available on a selection of Panasonic's 2015 TVs. MORE: Freeview Play: What is it? How can you get it? YouTube could soon become a video on-demand service like Netflix and Amazon Prime if sources are to be believed. It’s claimed that several YouTube executives are visiting various Hollywood studios and production companies to win pitches and deals that would let it become a source of content for streaming. The news follows the release of YouTube Red, which removes ads from videos, and YouTube Music, which has already turned the video website giant into a music streaming service. Teufel has released its first Bluetooth speaker in the form of the Rockster XS. It’s been designed with outdoor use in mind and so has a solid aluminium enclosure and rugged outer shell. Connection is via aptX Bluetooth and NFC is on board for use with compatible devices. Two Rockster XS speakers can be connected together via Bluetooth to create a stereo pair. The Rockster XS speaker is available now for £130. Trainer by Gibson, part of the Gibson Brands portfolio, has launched the Ti100 sports earphones, designed in collaboration with Usain Bolt. The Bluetooth wireless in-ears feature a proprietary Aeroflex system that is said to allow users to switch easily between in-ear and a more secure ear-hook style. NightNav technology is also on board to help make users safe at night and includes LED lights on the backs to make them more visible. Trainer by Gibson claims the battery will last six and half hours and that they are rain and sweat resistant thanks to Weatherseal technology. The Ti100 in-ears are available now in black or white for £150.